Motion sickness is the feeling of sickness or nausea when in a moving vehicle. There are treatments available from Prescription Doctor to reduce the symptoms of this debilitating condition. You can order Cyclizine online from Prescription Doctor following a quick medical questionnaire. 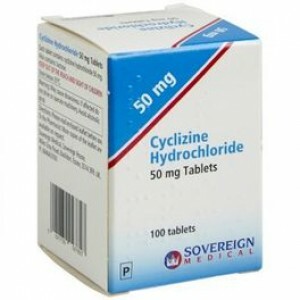 Cyclizine is an antihistamine which is used to treat nausea and vomiting brought on by motion sickness and vertigo. Motion sickness is a feeling of nausea and malaise which is often caused by a moving vehicle. The vestibular apparatus in the inner ear relays information to the brain about the position of the body. This apparatus gives us our sense of balance and orientation. Together, the eyes, inner ear and brain determine whether the body is in motion. They send messages to one another, asking whether there is motion which can be both felt and seen. The vestibular apparatus senses motion when no motion is perceived. This happens in aircraft and boats with limited ways of viewing the horizon or movement of the vehicle. It can also occur in a car if you look at something like a book or electronic device while the car is in motion. Motion is perceived but not reported by the vestibular apparatus. This is also referred to as simulator sickness and has been countlessly reported during the screenings of films with erratic movements. During these situations, the brain becomes confused and releases chemicals called histamines to induce vomiting. Cyclizine blocks histamine and muscarinic receptors located in the chemoreceptor trigger zone (CTZ) in the brain. Cyclizine works by blocking histamines, which can cause an emetic (sickness) effect, in the brain. Cyclizine should be taken as recommended by the doctor. To prevent motion sickness, take one 50 mg tablet with a glass of water an hour or two before travelling. Cyclizine can be taken with or without food. All medicines carry the risk of side effects. It's important to understand and be able to identify the possible side effects associated with your medicine. The above is not an exhaustive list of side effects. A more detailed list of side effects can be found in the patient information leaflet enclosed with your medicine. If you experience any side effects, report them to your doctor. If you experience the symptoms of an allergic reaction after taking Cyclizine, stop taking the medicine and seek immediate medical attention. Will Cyclizine interact with any other medication I am taking? Tell your doctor if you are taking any other prescribed, over-the-counter or herbal medicines. Always keep this medicine out of the sight and reach of children. Can I take Cyclizine if I am pregnant or breastfeeding? No, you should avoid taking Cyclizine if you are pregnant or breastfeeding. Speak to your doctor for further advice. Will Cyclizine affect my ability to drive or operate machinery? Cyclizine can have an effect on your ability to drive or operate machinery. If you experience side effects such as dizziness, drowsiness or blurred vision, do not drive, ride a bike or operate machinery. Can I drink alcohol while taking Cyclizine? No. Cyclizine can increase the toxicity of alcohol. Therefore, alcohol should be avoided. How long does it take for Cyclizine to work? Cyclizine starts to work within 30 minutes but is most effective within an hour to two hours after taking. How long does the effect of Cyclizine last? Cyclizine is effective for between 4 and 6 hours.